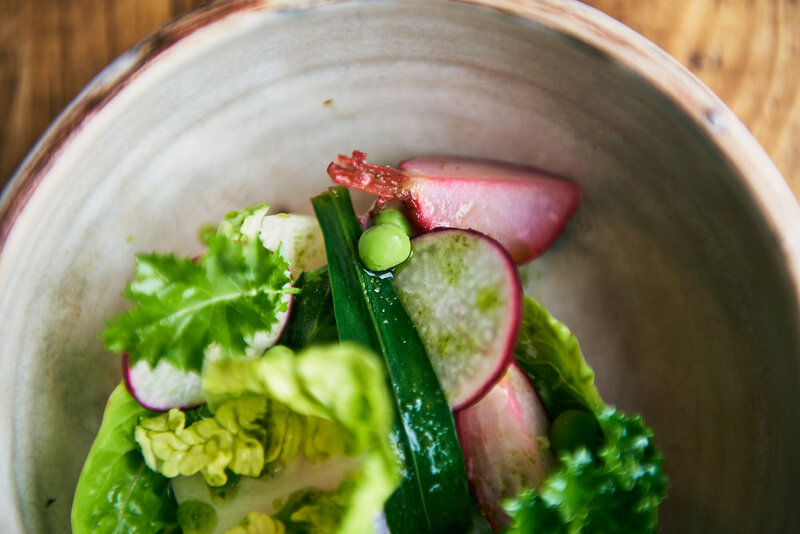 We serve a four course tasting dinner which changes regularly depending on the local seasonal produce. All food in the restaurant is prepared to nutritionally support the body. Our dining room is relaxed and informal, ensuring every guest has a unique experience. We are a no menu restaurant, we do adapt dishes for dietary preferences. Four course tasting menu, using locally caught fish, slow cooked organic meat and seasonal vegetables. All dishes are free from gluten, dairy and refined sugars. Available Thursday, Friday & Saturday evenings. Carefully selected beverage list and seasonal cocktail to complement our menu changes. Wine expertly matched to each course is an optional experience. Four courses, using fresh seasonal organic vegetables, all aspects of the menu is gluten free including our bread made in house everyday. Available Thursday, Friday & Saturday evenings. Fresh locally caught fish with gluten free batter or grilled, served with chips, pickles and freshly baked bread. We launch in April, every Saturday lunchtime. Three course seasonal Sunday Roast Lunch served with free-flowing cava. Freshly picked vegetables & grass fed, free range organic meat. *Our restaurant is not suitable for under 5 year olds.